and saved £8,000 in fees!" Find out more Add your property now Looking to rent instead? Buying a property is said to be one of life's top three most stressful experiences. Not any more. I Am The Agent allows you, the property owner, to take control. Selling your property online has never been easier with IATA's property assistants saving you thousands along the way. Within hours your property is seen by thousands of potential buyers! As a self service online estate agency, we've made it our mission to give you as much choice as possible whether you want to sell or rent your property. Below is a comparison of the various sales packages we offer to help you pick the one that best suits your needs and your budget. Including: sale statement, memo of sale, appointment & viewing recorder, sale checklist. Need help with the viewings? We can arrange a 1 hour block for you for £130. Want to stand out from the crowd. When you choose I Am The Agent to sell your property on-line, you can be confident that we will promote your house on the UK's largest property portals. These include Rightmove, Needa Property, Prime Location, Globrix and Zoopla for a single fixed fee. Why sell your property with I Am The Agent? With I Am The Agent you're in charge. Simply register, upload your property details for us to arrange a convenient valuation and wait for the enquiries to come through. We then manage the viewings for you so you can show your house at times convenient to you. At the I Am The Agent online estate agency we know that you don't want to pay a large commission at the end of the sale process. We know you want as many people as possible to see your home and would like visibility on Rightmove, Prime Location, Zoopla and other UK portals. We know that you know your property and surrounding area better than anyone. We also know that 80% of buyers begin their search for a new home online - so join them and pick one of our sales packages to best suit your needs. Advertising your property for sale online can save you thousands of pounds in traditional estate agent commissions. We understand that sometimes you'd prefer not to go it alone though and offer a fixed fee solution if you'd rather have one of our team manage the sale rather than sell a property with our online agency we can assist with chose a service that fits you. We have agencies throughout the UK, allowing you to sell your property for a fixed fee without compromising on a professional service or property visibility. 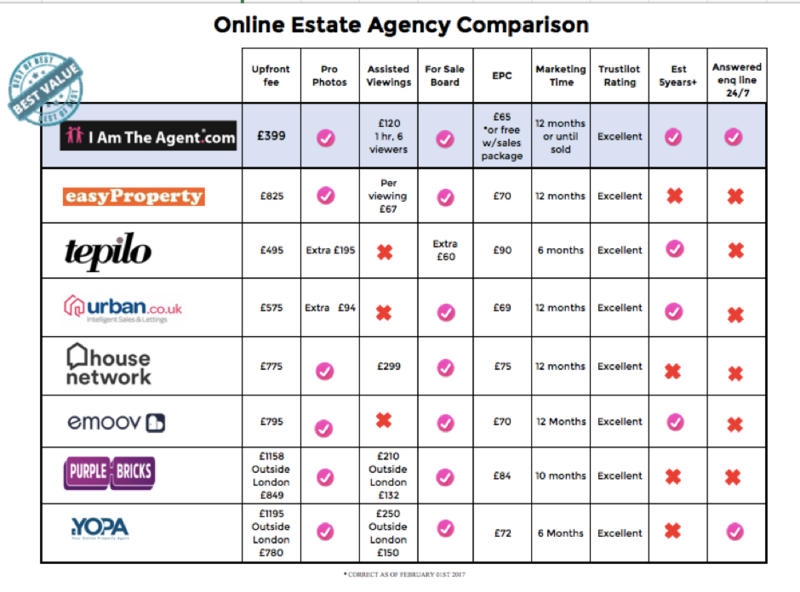 When you register with I Am The Agent, you're choosing to sell your house with a low commission estate agency. We'll promote your site on all of the UK's leading property portals, guaranteeing maximum exposure for minimum cost. We'll assist at every stage of the sales process, from writing a property description, carrying out a free property valuation and dealing with enquiries to arranging viewings, fielding offers and arranging conveyancing. And the best part is, when the sale is complete and the keys change hands, there's no commission to pay. To appoint one of our friendly, experienced and professional agents to sell your home, register for free and let us take care of the rest. We complete thousands of valuations every week for home owners and landlords who want the speed and efficiency that comes from using an online estate agent as well as the cost savings of using a no commission agent. Our local knowledge means we'll consider the things that are important to you and to buyers. Things like good schools, transport links and leisure facilities. And it's free. Click the button below to request a free online valuation of your property or call us on 0844 504 5994 for further information.